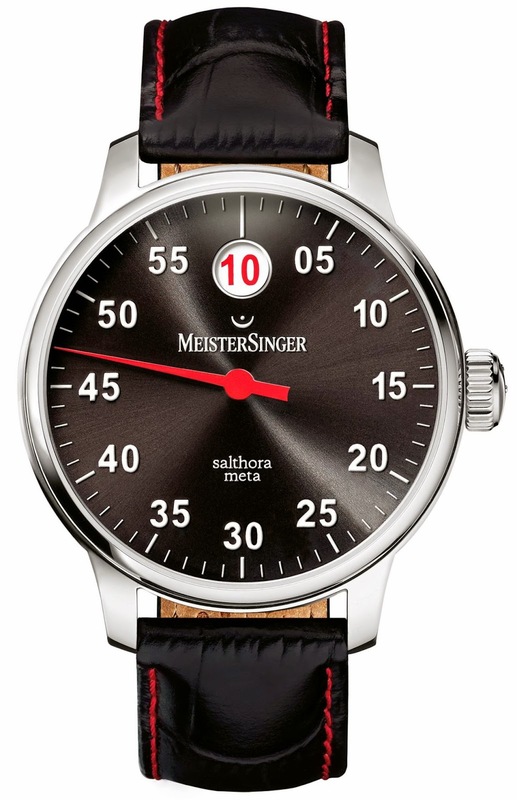 At the Baselworld 2015, MeisterSinger unveiled a sporting version of its “jumping hour” watch Salthora. 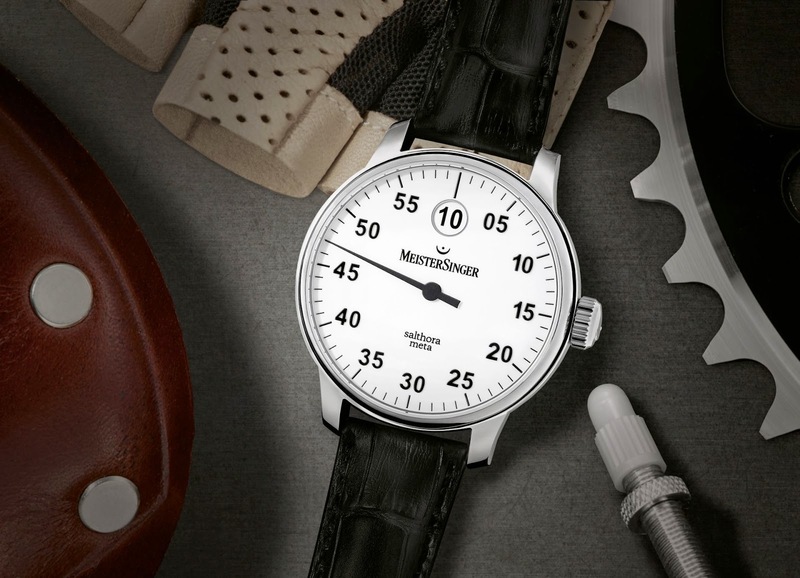 MeisterSinger specializes in manufacturing watches that feature one single hand. However, the Salthora, which was first presented in 2014, features a minute hand instead and the hour is shown in a circular window positioned at 12 o’clock. As soon as the hand reaches the middle of the window every sixty minutes, the number denoting the next hour appears in the window like a flash. 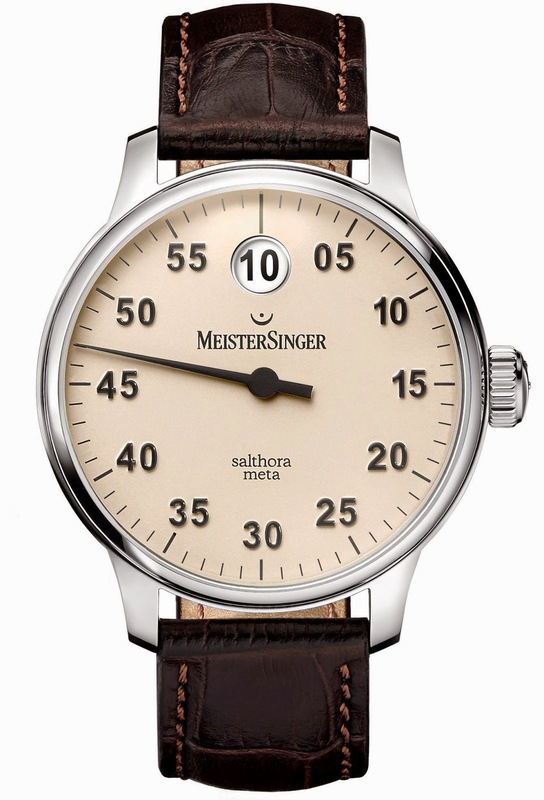 For this timepiece, MeisterSinger had a module designed for the tried-and-tested ETA-2824-2 and Sellita SW 200-1 Swiss movement, which ensures the punctual, exact jump using painstakingly balanced mechanics. The tension required for the actuating lever of the hour disk is built up by a snail attached to the minute wheel in the course of 60 minutes. Hence, power is not withdrawn suddenly from the mainspring barrel, but continually, which only influences the workings to a minimal degree. The Salthora Meta is 43 millimeters in diameter and has a striking, cylindrical stainless steel case. It is waterproof up to 5 atm and fitted with a six-screwed exhibition back. The digits of the minutes and of the hour display are depicted in a sans serif Helvetica typeface. The watch will be available in four versions. 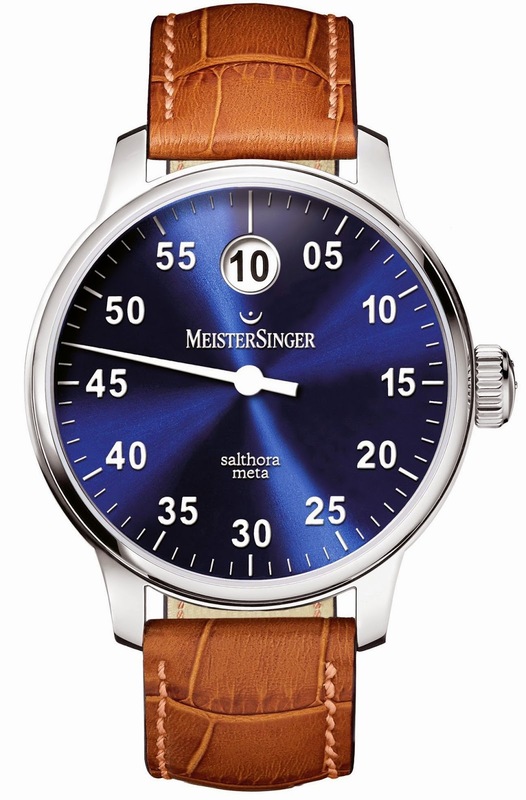 The models featuring a white or ivory-colored dial will be fitted with an hour disk in exactly the same color. Here, the complication is not immediately obvious. However, the hour disk in the blue version is white, just like its hand. The black Meta with the hour digits and hand in signal red has an almost dramatic impact. The Salthora Meta will be available from June 2015 onwards.